M. Night Shyamalan is a director who witnessed an overwhelming amount of praise rather early on in his career. This film, "Unbreakable," "Signs," and for a select few, "The Village." Shyamalan really figured out how to master suspense driven filmmaking with many proclaiming he was the new Alfred Hitchcock. These were horror films that were built around the environment of the world he was creating. This world was our own. It was instantly recognizable and one we could project our own life experiences onto, thus making them believable and terrifying. While his films venture into the supernatural and the mystical, they still revolve around universal truths. "Signs" is about the fear of the unknown as is "The Village." But "The Sixth Sense" taps into something that just about everyone that is living is afraid of; the fear of death and the uncertainty of the afterlife. What happens after we die but more specifically what happens to our soul? Do we wander aimlessly around the world, constantly searching for some sort of solace? Or do we peacefully pass on in hopes of a joyful existence after we are gone? 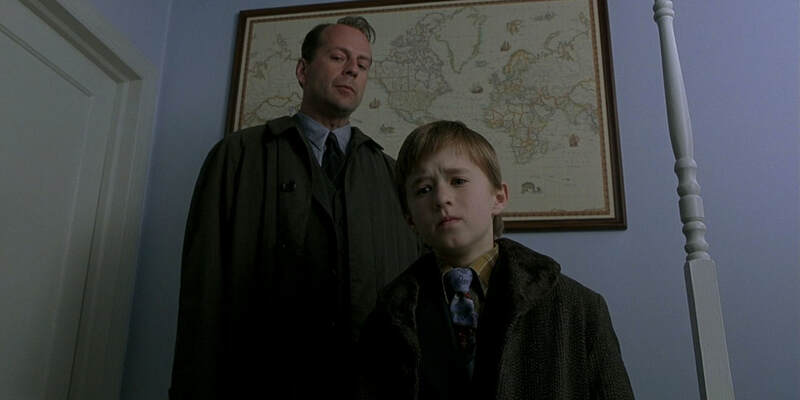 With a fantastic but sometimes rocky screenplay, brilliant performances from the ensemble, and sharp direction from Shyamalan, "The Sixth Sense" not only provides its own answers to these questions but also delivers a great horror film simultaneously. Child psychologist Dr. Malcolm Crowe (Bruce Willis) is a psychologist searching for something that is missing from his life. The film opens with himself and his wife Anna Crowe (Olivia Williams) returning from an awards dinner that was being held for Malcolm. After a violent altercation with one of his former patients who actually ends up shooting a gun at Malcolm, Malcolm's life heads in somewhat of a downward spiral. He loses a bit of passion in his work and his marriage starts to fade away as well. Constantly on the look for something to reignite that fire in his stomach, he is introduced to a young boy named Cole Sear (Haley Joel Osment). Malcolm begins to spend a good amount of time with Cole hoping that this patient will help him gain some momentum back in his day to day life. But as he spends more and more time with Cole, he learns that Cole lives with a rather dark secret: he can see dead people. Some would argue that "The Sixth Sense" does not fall into the cinematic genre of horror. But one thing that gets criminally overlooked about the film is its horror elements. The emotional and dramatic moments of the film are incredible and it is easy to overlook just how frightening some of the other moments actually are. The visuals are absolutely chilling at certain times. The framing, lighting, and makeup of the spirits whenever the ghosts are shown are excellent. Shyamalan's use of the Kuleshov effect in the editing room is downright brilliant precisely because it manages to take the mundane in a small town in Pennsylvania and somehow make it eerie and transcendent. Specifically, cuts from character's faces to an empty space in a room or an inanimate object in the room. The sometimes off-center framing in scenes where Cole sees the spirits are haunting. Everything seems symmetrical and organized and then Shyamalan will throw in a spirit to off-set all of the comforts you can find within a shot. The composition is crucial within this particular world but so is the use of color, more specifically one color. "The Sixth Sense" cherry picks when it decides to traverse its audience into the realm of the supernatural. While you would normally assume it would be with a simple cut, camera move or musical cue, "The Sixth Sense" does this by introducing us to the color red. Whenever there is a moment in the film where we are about to witness something supernatural, the color red organically appears somewhere in the world. Whether it is an article of clothing or the color of a sign or even perhaps a red balloon, red is not only one of the most striking colors to the human eye but symbolically it can represent a lot of different things: love, hate, malice, passion, etc. In "The Sixth Sense," red is meant to represent the passage from the natural world into the spiritual world. Whenever Cole or we as an audience witnesses something supernatural, red appears in the scene. It's highly cinematic and adds a lot to what is already a wonderfully constructed screenplay and vision by Shyamalan. While the film's visual elements are exceptional and the high point of M. Night Shyamalan's career, the film thrives through its gut-wrenching characters and the bonds they share with each other. Having to watch these characters fall apart and attempt to put one another back together is heartbreaking, as Shyamalan presents Cole's gift as a tragic curse that affects him, his mother and Malcolm. Everyone in the ensemble pulls their own weight to deliver the maximum emotionally impact required from Shyamalan's script. Bruce Willis is gentle and reserved in a way that we rarely often see from him. Toni Collette is tear-jerking as the helpless mother who desperately wants to help her son. Haley Joel Osment is electrifying as the terrified yet innocent child constantly searching for answers to his tormented visions. While the performances from the main cast are terrific across the board, some of the smaller roles are a bit on the ridiculous side though. Mainly some of the other child actors in the film can't capture that youthful bliss or passion that Osment seems to do so well and rightfully earned him an Oscar nomination for Best Supporting Actor at the age of eleven years old. "The Sixth Sense" is Toni Collette's only Oscar nomination to this day and an incredibly well deserved one. Collette is brilliant in her delivery and the way that she is able to use her eyes to convey different changes in emotion for her son Cole. While this is a tool a lot of actors use, there is something about the depth of Collette's eyes that make her facial features twice as powerful. She is very much the stand out in this film which is also the case in Ari Aster's "Hereditary." With her performances in both films and potentially another Oscar nomination on the horizon, she (Intentionally or unintentionally) becomes one of this generation's scream queens with her performances in both films. "The Sixth Sense" is regarded as not only one of the greatest horror movies ever made but it became a cultural phenomenon in 1999 (Mostly due to its now famous twist ending which still holds up quite well due to its subtlety and emotion). Everything about this project feels so crisp and precise. Shyamalan knows exactly how to use the camera in this film and how to make the camera act as a portal from our world into the spiritual world. A majority of the dialogue between characters is downright flawless but there are a few hiccups here and there, mostly with the supporting cast. Visually the film is a stunner in its use of composition and symbolism. M. Night Shyamalan's career quickly escalated and his output never reached the same highs both critically and financially as "The Sixth Sense" did (Although, "Split" came close to showing some of that earlier promise). However, regardless of the many disappointing films he made afterward, we will always have "The Sixth Sense."